Hanbury Manor Marriott Hotel & Country Club is a unique resort hotel set on 200 acres of spectacular landscape. This stately Jacobean style country house surrounds you with timelessly elegant design accents like towering wood panelled libraries, inviting open fireplaces and unique furnishings. The hotel boasts beautifully appointed rooms and suites, stunningly refurbished function rooms, an award winning spa and beautiful restaurants offering choices from British cuisine to light fare delicious dining experiences. The prestigious Championship golf course was the first to be designed by Jack Nicklaus II. The course is now widely recognized as one of the best in England, with each hole offering a different challenge. 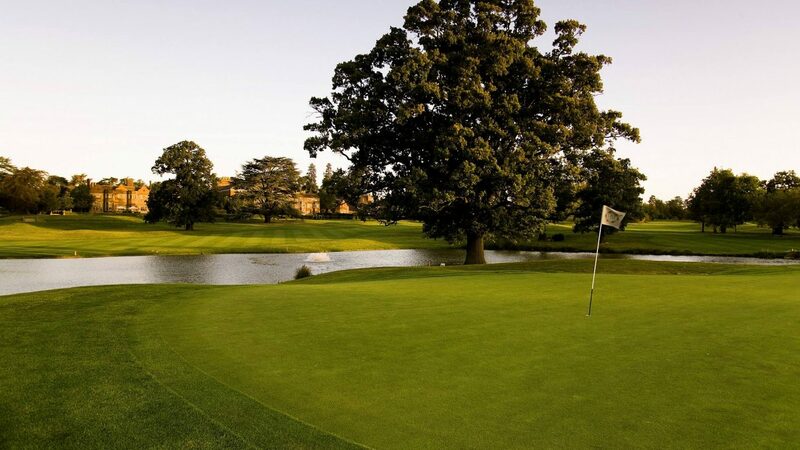 Hanbury Manor provides an exciting experience for golfers of all skill levels. From the championship tees, the course measures 7,052 yards. The USGA greens and numerous tee boxes provide excellent surfaces and year round playability. Play 15 of the finest golf course in the World at Hanbury Manor. The hotel’s cutting edge golf simulator is available for exclusive hire from £20 per person, per hour. The simulator includes numerous games and competitions such as Nearest to the Pin and Longest Drive. Hanbury Manor is located just off the A10 at the Ware exit. Hanbury Manor Hotel has 161 bedrooms available including luxury suites.